"Do not worry, father, for with the power of this sword I will vanquish Aku, sending him back into the pit of hate from which he came." Genndy Tartakovsky is a veritable hot commodity at the Cartoon Network cable channel, in that he is responsible for three successful series: Dexter's Laboratory, The Powerpuff Girls, and Samurai Jack. He has a very distinctive animation style, bordering on true minimalism, and while the offbeat weirdness of Dexter and The Powerpuff Girls are geared strictly for laughs, Tartakovsky really bent the rules into an unrecognizable heap in 2001 when he launched this Yojimbo-eque series about a noble Samurai (voiced by Phil LeMarr), armed only with a mystical sword, who is magically cast from feudal Japan far into the distant future after a battle with the malevolent shape-shifting demon Aku (voiced by Mako). The towering Aku, the self-professed "master of masters and shapeshifting master of darkness," with wild flaming eyebrows, is the recurring villain throughout the series, though Jack (who gets his name in Episode II) spends most of his time wandering the future doing battle with and hacking the limbs off of assorted armies of menacing robots and monsters as he tries to find a way to return back to his own time. It's a tough row to hoe for Jack, because he is always putting someone else's needs before his own, and as a result he is always forsaking an opportunity to help himself in order to help another. It's the samurai way, baby. If you have never seen an episode, one of the first things that will likely catch you by surprise is the sparse dialogue, which, on the surface, seems like kind of a daring thing to do in an a half-hour animated series. 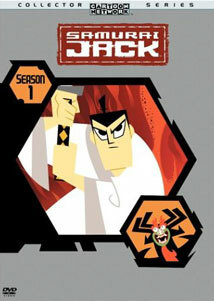 Jack may go seven to ten minutes (or more) without uttering a single word, with Tartakovsky instead choosing to tell the story strictly on the basis of his unique animation style. Episode VII, in which Jack does battle with a trio of deadly archers, is probably the finest example of this from Season 1, with the use of ambient sounds and sweeping visuals completely replacing the need for dialogue (at least until the final few minutes). This is serious stuff for the most part, and though humor is used about as sparingly as dialogue, the season ender, Episode XIII, forsakes all the drama and goes strictly for laughs. Aku, miffed at his growing level of unpopularity amongst children, relays some progressively twisted variations of well-known fairy tales, all with Jack as the villain, to a captive group of kiddies. The gags are layered and bizarre (look for a strange appearance by Puss N' Boots and a disturbing Humpty Dumpty scene), and it was kind of fun to see Tartakovsky revert back to the funky strangeness of Dexter's Laboratory and The Powerpuff Girls for at least a few minutes. All thirteen episodes of the first season are collected here on this two-disc set from Warner, and one can see how, by throwing traditional "cartoon" storytelling devices to the side, Tartakovsky opted for a more cinematic approach with Samurai Jack. By borrowing visual elements and inspiration from an assortment of highly stylized action films, and for action sequences infused with such motion picture techniques as split-frames and widescreen, Tartakovsky's series is less like a cartoon than it is a work of action-movie art. In the liner notes for this set, he fesses up to a love for Conan the Barbarian, The Good, the Bad, and the Ugly, Star Wars, Blade Runner, and Seven Samarai, and this fan adoration is evident in the dramatic visual look and feel in every frame of Samurai Jack. Image Transfer Review: All thirteen episodes are technically presented in their original 1.33:1 full-frame aspect ratio, but that certainly doesn't prevent Tartakovsky from veering off into occasional nonanamorphic widescreen sequences for stylized dramatic effect. The transfer itself is well done, with colors looking exceptionally bright and crisp throughout. No compression or pixelation issues to speak of. Audio Transfer Review: Warner has issued Samurai Jack: Season 1 in Dolby Digital 2.0 stereo surround, and while the mix itself is not overpowering, it really does a nice job showcasing the intricate score elements and sound effects that Tartakovsky employs to help give his series a distinct flying leap over most other animated series (check out Episode VII, where Jack must figure out how to gain access to a heavily fortified fortress). Even without much in the way of dialogue, sound is where this show separates itself, and the presentation here works very well in that regard. Rears perk up on occasion, but this is largely a front-centric mix with decent separation and directional imaging. Extras Review: Creator/director Genndy Tartakovsky and storyboard artist Bryan Andrews provide a full-length (that's just 22 minutes, by the way) commentary for one episode (Episode VII), and it was so enjoyable I wish there had been more. It is sometimes tough to tell who is who speaking, but the content is nonstop, and they discuss the nods to various films and film styles, the challenge of injecting humor into some episodes, and the overall challenges of developing such an adventurous animated series. A great track, but 22 minutes out of over 4 hours worth of material just ain't fair. Also included is The Making of Samurai Jack (07m:01s), featuring comments from art director Scott Willis, storyboard artists Bryan Andrews and Paul Rudish, voice talent Phil LeMarr, along with Tartakovsky himself. Like the commentary, it is woefully brief, with Tartakovsky's underlying desire for "sword fights, giant monsters, and robots" seemingly the mantra of the whole show. Trailers, an Original Animation Test (a two-minute sequence with Jack battling some familiar robotic bugs) and an eight-minute automated Original Artwork segment are also included. Each episode represents one chapter, and subtitles are available in English and Spanish. Labeling this inventive animated series, represented here by a two-disc Season One set, as a "cartoon" is a complete disservice to self-respecting animators everywhere. This is cinema. Creator Genndy Tartakovsky has really raised the bar on just how imaginatively a story can be told in 22 minute chunks.